In a mixing bowl add dry ingredients like Flour, Baking Powder, Baking Soda , Sugar (In the video I forgot to mix with dry ingredients and added later with wet ingredients) and Salt, whisk them to combine. Now add liquid ingredients like melted butter , buttermilk (for orange pancake do add orange juice right now) and vanilla extract as shown in the video tutorial. Make a lump free thick batter as shown. You may need a tbsp more or tbsp less butter milk for the thick yet pouring consistency batter. In a well heated pan / griddle pour a ladle full of pancake batter, make sure the pan is well heated otherwise your pancakes don't turn fluffy. Wait for the batter to change to porous texture and if you notice, sides of the pancake get light brown in color. Now gently flip them and they immediately increase in height (its a beautiful thing to notice, I always love to watch it and somehow shown it in the video as well. If they are well cooked and both sides turned gorgeous golden brown color, transfer to a serving plate. The batter consistency is important for the perfect shaped pancakes. If it is too runny then you won't get perfect rounds however the pancakes tastes good and spongy. I use double acting baking powder and soda wherever the recipe calls. So if you feel the pancakes are not rising properly do add any leavening agent a pinch and try with remaining pancake batter. 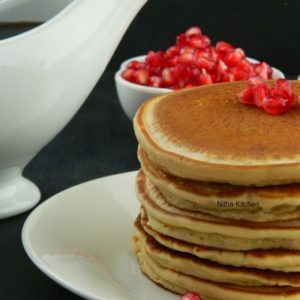 You can replace vanilla extract with 1/2 tsp cinnamon powder for orange wheat pancakes. If the batter turns too runny add few tsp flour to bring it to right consistency.